Yi He – Nan Nuo Shan 2012. First Spring Tea. The first time I tried this tea, a few weeks ago, it had just been pressed and was still adjusting. The flavours were a little muted – to the point that it reminded me more of a Shi Tou Zhai tea from the Banma area – which often gets passed off as Nan Nuo Shan tea. On drinking it again the other day, after it had had some time to regain its composure, it’s clearly a Ban Po Lao Zhai tea. 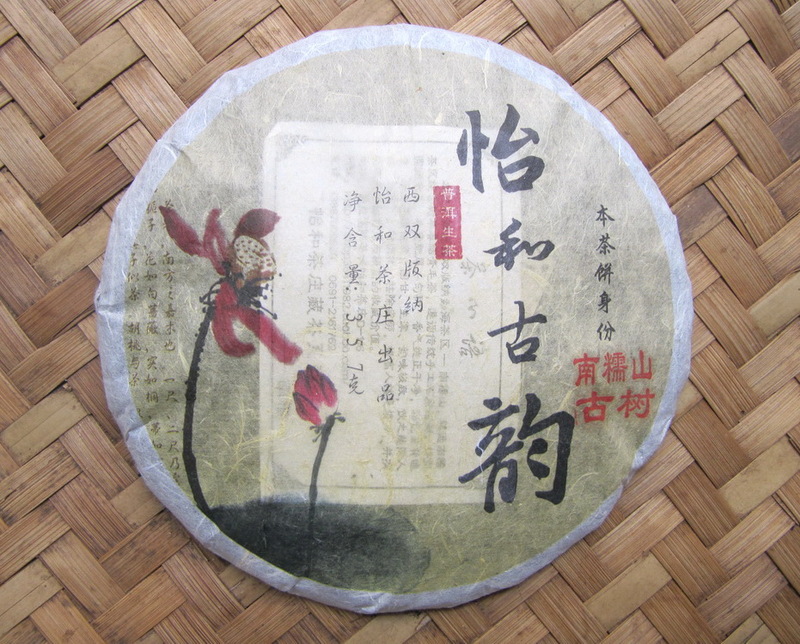 This years mao cha from Nan Nuo Shan has a slightly darker tinge than the more typical grey-ish colour of the dry leaves. This tea was dried in the shade after pressing and has, because of this, perhaps retained a little more of its ‘green-ness’. There is a slight qing chou wei, a green vegetal aroma, that suggests the frying was perhaps slightly shy. This is often done deliberately in order to try to preserve more of a teas enzymes. With it comes a slightly less obvious fragrance, as is the case with this tea. The fragrance in the cup is a rather dense mi xiang or honey fragrance. The rukou is quite gentle and sweet. The broth feels smooth and at the same time carries a little bitterness that lingers on the upper palate. There is some astringency which transforms quickly, producing a pleasing huigan that seems to be present both on the surface of the tongue as well as the upper palate and the throat. The tea sinks well and doesn’t get stuck in the throat as some teas do. The fragrance is not of the kind that bursts in on the first mouthful, but shows itself at a leisurely pace, floating up from the throat into the nasal cavity some time after the tea has been swallowed. The broth is a very pleasing, clear, delicate yellow. The steeped leaves look nice enough, with a little redness here and there, but overall a good evenness in the colour. See the slideshow below for more photographs. If you would like to try a free sample of this tea (postage will need to be paid) please contact Puerman at CreamofBanna. Whole 357g cakes are also available. Price 380RMB exc. postage.